To say that my arm was twisted into a road trip to Ottawa last weekend would be a gross understatement. 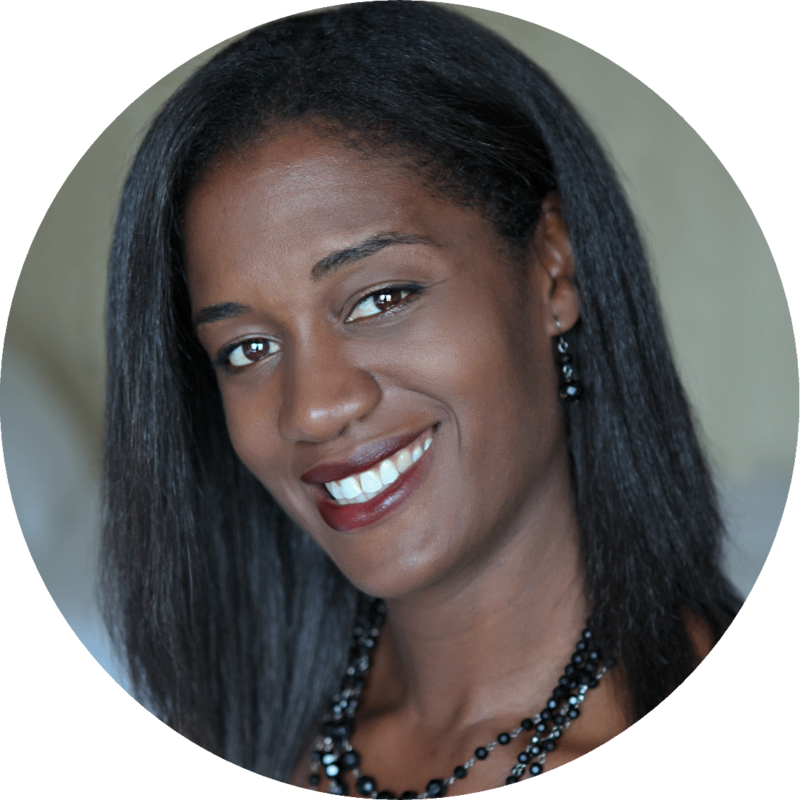 My arm was pulled, held behind my back and then used to slap me into submission. 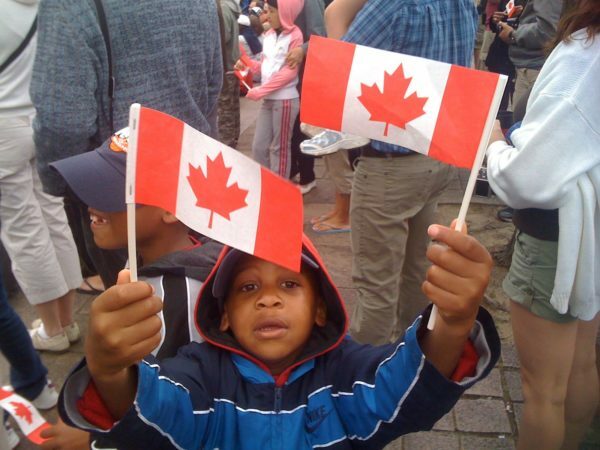 It’s not that I don’t love Ottawa, I do. It’s one of those cities that holds incredible memories for me and for my family. 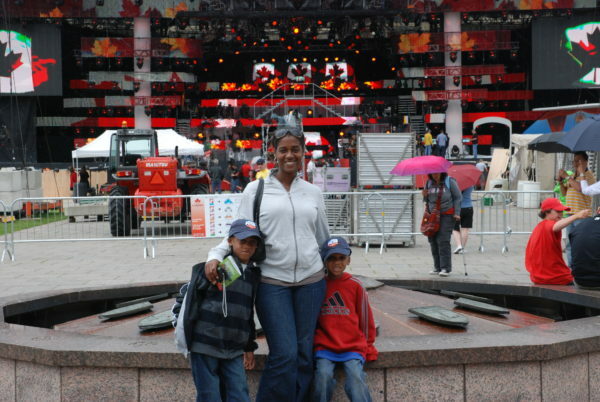 The kids have come to Ottawa before and loved it but we tend to stick to the warmer months. As a journalism undergraduate student I rode public transit, shopped in these malls and walked the streets past statues and Parliament Hill regularly. And yes, I took the cabs with friends to Hull (neighbouring Outaouais, Quebec) where parties ran later and the legal drinking age is lower. Even then I marveled at families who would be out in the coldest of temperatures. 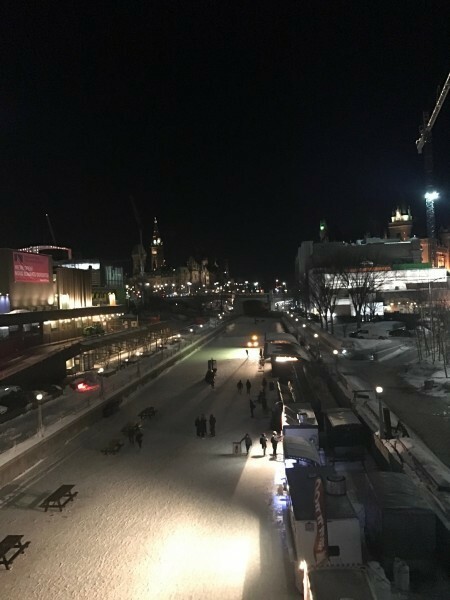 Bundled up in scarves and mitts with their infants plopped in sleds, they’d head out for strolls along the Rideau Canal willingly. Ottawa loves winter. My husband and kids love winter. I, however, do not. 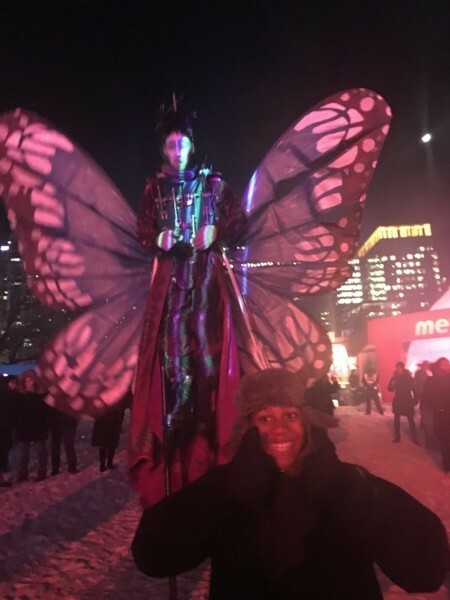 So, although the thought of heading to the city always makes me happy, the idea of celebrating winter there was not high on my list. I’m more of a “call me when the tulips come out” kind of girl. But the arm-puller was persuasive. Come stay in the castle, she said referring to the gorgeous Fairmont Chateau Laurier . Let’s go to the spa, she said. And so I gave in. 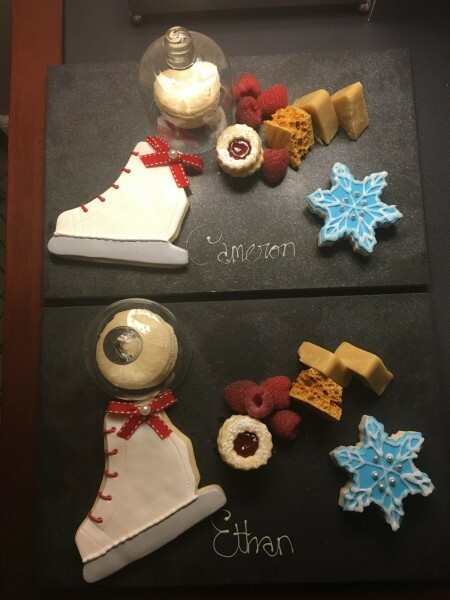 The boys wasted no time digging into these creative Fairmont treats. I prefer my winter in sweet treat form. The drive to Ottawa is about 4.5 hours from Toronto. Last week was a crazy one with two TV appearances, a slew of deadlines, one son going through his first set of exams while the other worked a winning basketball tournament into a week of projects and homework. We were burnt out and a long, quiet drive turned out to be exactly what the doctor ordered. The good times started as soon as we arrived. 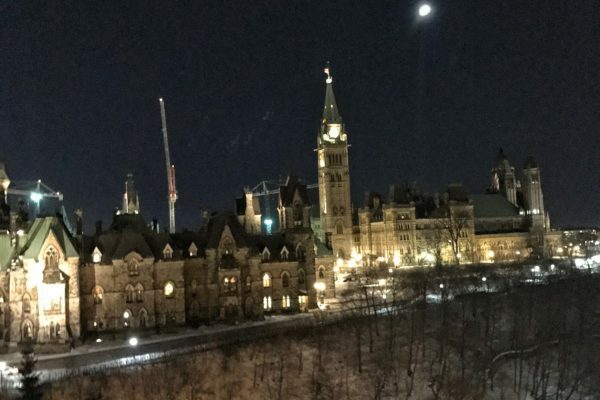 We plopped our bags down into our recently renovated room at the Fairmont Chateau Laurier, peeked out at Parliament Hill through our window (hint: Rm 512 has an incredible view!) and then set out for a pub dinner. At D’arcy McGees on Spark Street we shared Poutine and pot pies and heard about the history that took place only steps from where we sat. The lawyer and father of Confederation was assassinated on Sparks Street as he returned home in 1868 and his attacker was hung not far from where the pub now sits. The building that has been a pub for the last 20 years was actually built in 1883! And with live music on hand and a mix of families and students throughout it was a great start to the weekend. Full and craving a chance to walk around, we bundled up and headed over to Crystal Kingdom in Confederation Park. 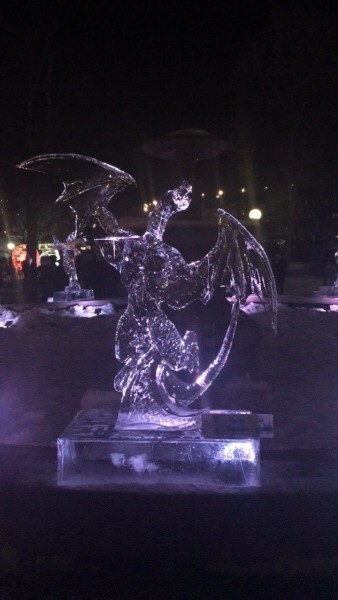 For Winterlude the park is filled with impressive ice sculptures and interactive artists and acrobats. And at the very back of the park, a DJ spins great tunes amidst a laser light show. It didn’t take long for the four of us to start sharing our moves. The next day we split up. 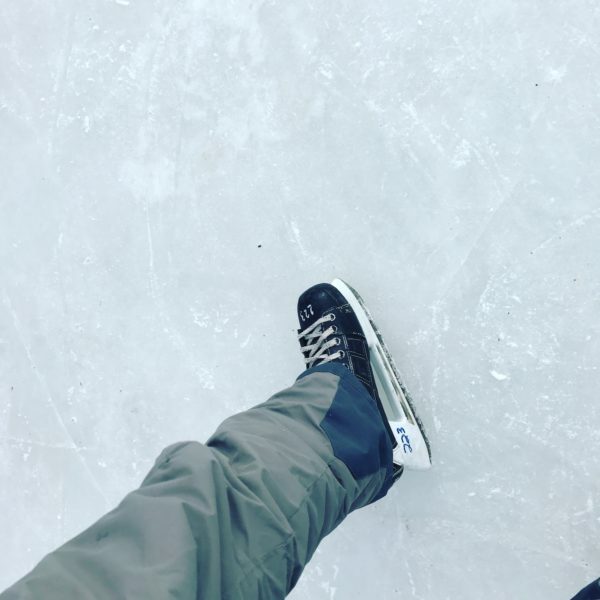 The boys took to the Rideau Canal intent on skating the full 7.2 km. Ten minutes in they sent photos of themselves at the Beavertails (the popular fried dough covered with cinnamon and sugar ) stand. While they only made it about halfway down the canal, there was no question that they had a blast. One foot in front of the other on the Rideau Canal in Ottawa. And while they did that, I tried something new too. The Nordik spa. 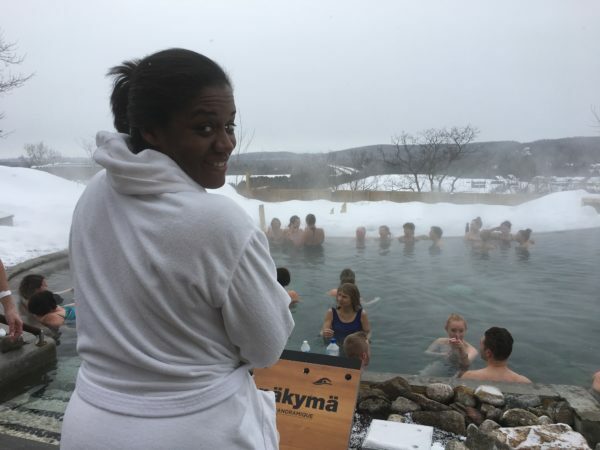 While the idea of a bathing suit and -7 degree temperatures weren’t the way I expected to “spa,” I have to admit that despite some initial misgivings I really enjoyed it. Preparing for a dip in the outdoor infinity pool. And yes, that’s real snow. The space is filled with saunas, soaking pools, waterfalls, a yoga studio, heated beds, outdoor hammocks (also heated) and more. 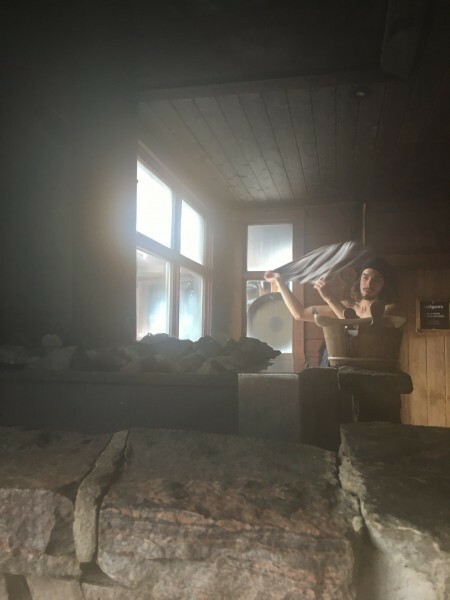 We stopped in at the Aufguss – where balls of ice are infused with scents and dropped onto sauna rocks and then talented Aufuss masters use towels to move the heated air and scent throughout the room. It was intoxicating. There’s also a salt pool that mimics the abilities of the Dead Sea. It’s said that a 1 hour soak is the equivalent of 5 hours of sleep! In the interests of time (and with the full knowledge that I’d never give that only an hour) we headed for the outdoor infinity pool instead and with glasses of Prosecco in hand toasted the incredible views. When the family reunited after lunch we were all happy. Our next stop was Jacques Cartier Park. 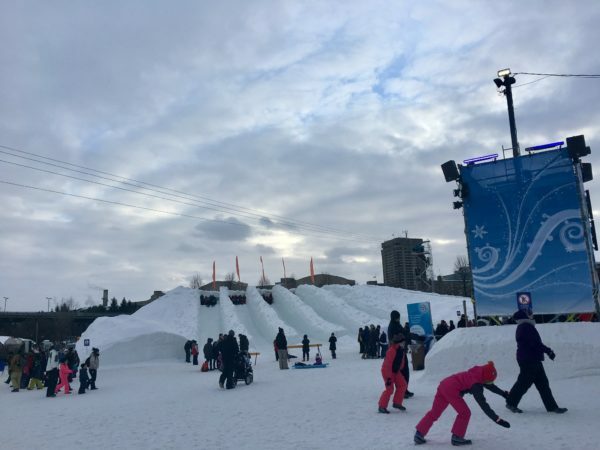 We walked across the bridge to Quebec (about 15 minutes from the hotel) and spent the afternoon on ice slides, dog sledding, eating more Beavertails (of course) and enjoying the snow sculptures throughout the park. The fours of us laughed all the way down. 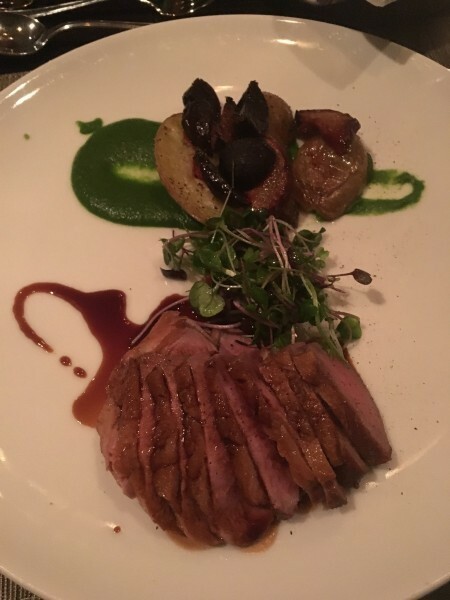 And then to bring the weekend to a close we dined with our friends at Wilfred’s at the hotel where the meal – and the company – was divine. On our final morning we had big plans. Would we take in the Museum of Natural History? Wander the Byward Market? Explore Spark Street or Parliament Hill? Nope. We slept in, waking in time to grab brunch at Wilfred’s (yum!) before starting the long, slow drive home. It was a whirlwind weekend. One filled with lots of laughs and some great new memories. 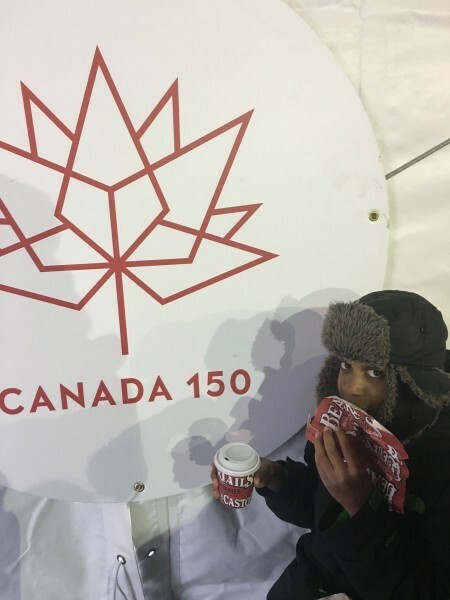 And although I wouldn’t quite call myself a winter lover, Ottawa proved that even I can learn a thing or two about how to make it better…and that there’s no such thing as too many Beavertails.